So this poetry business? How did it all begin? Well, not that he makes a big issue about it, but John grew up in Darndale. And poetry was a pursuit you didn’t broadcast. It was kind of secret and furtive, he says. But words intrigued him right from a really young age. “I shared a room with an older brother and remember listening to Simon and Garfunkel,” he tells me as we sit having tea outside Neary’s of Chatham St. Beside us the flower sellers sing of their various collections as John goes on to say he “adored their lyrics and their stories.” When the vinyl span, John was rapt. Slowly the words ‘Home Farm and UK trials’ appear in the conversation. UK trials? Arsenal no less! But he didn’t like it. He was 17 going on 18. He points out the fact that it was an ugly time in England with Thatcher and the miners’ strikes. “I just didn’t like it. I was homesick” he says. So he went back to Dublin – and took up coaching. In his early twenties, he was coaching guys 10 years his senior. “I was telling them what to do” he says. The charisma he exhibits on stage obviously worked wonders on the pitch too. And to this day, he says he still loves kicking a ball against a wall. A random meeting with a German girl in McDaids led to a move there. They split up after a while. But he stayed on some 11 years in Germany. He learnt German. And quietly kept writing. Although he toyed with various other forms of writing, he decided about seven years ago to focus on rhyme. And then one night he just googled “Dublin spoken word.” That led him to The International pub. Then over the next 7 years John won the All-Ireland Slam championship and pretty much all the laughs, respect and accolades going in the growing scene. 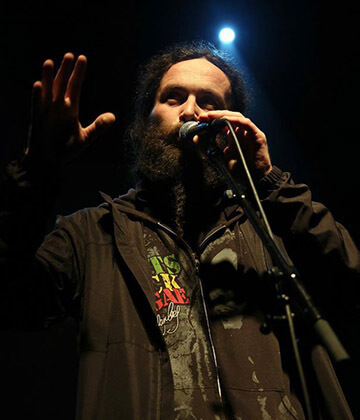 He has also been one of the main local attractions at the Dublin’s new Lingo Spoken Word festival, sharing stages with big international names likes Saul Williams. Now he says he would like to curate a night of his own. At the same time he says he is thinking of moving away from the three minute slam format. “I am thinking of fusing a few things together and developing pieces that are 8-10 mins long.” There’s a CD of his work which sold out down in Dingle at the Other Voices festival. And he says he is planning on getting a book out soon. “Given the demand out there, it would be nice to make a few bob,” he says. He was certainly shocked when he saw his poetic promo about Ireland and the Euros being broadcast on the BBC before a match. It was all very flattering but he didn’t get a cent. “I really need to screw the ambition head on,” he laments with a wry grin.